The photos of the dumplings the other night was so awful, I decided to make some more dough and use up the remaining Chinese dumpling filling from the other night. I'd only made about 40 or so the first time, so had lots of filling leftover and needed to use it. Joel mentioned that a different design was necessary if you were steaming them, so I searched about a bit I found that a lot were something close the above. Anyway, they still tasted great and in daylight I had a much better chance of getting a better shot. All I needed was some kind of little bowl for the dipping sauce. I'm wondering if I should try making them with self-raising flour and see if I get them more like buns. 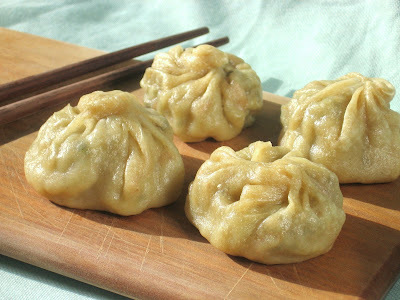 I've seen dumplings pop up on a few blogs lately and now I have a strong urge to make some of my own. Yours look great! I've seen them on quite a few blogs lately in different forms, too. I do love them though!